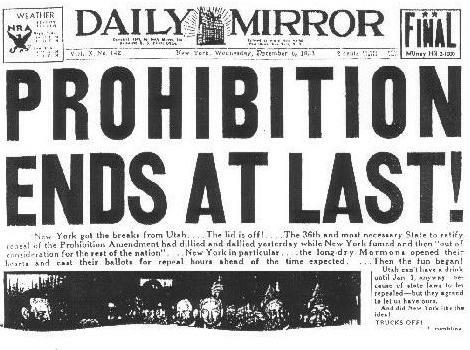 On December 05, 1933 the Prohibition on the production and commercialization of Alcohol was finally over in the United States when Utah became the 36th U.S. state to ratify the Twenty-first Amendment to the United States Constitution. Thus establishing the required 75% of states needed to enact the amendment (this overturned the 18th Amendment which had made the manufacturing, transportation, import, export, sale, and consumption of alcohol and alcoholic beverages illegal in the United States). Since then, the alcohol industry (widely hated and considered evil before 1933) started developing into one of the most successful industries of the modern world. The access to competition ignited an immense diversification of marketing, production and commercialization strategies that improved the quality, safety, additives and capabilities of the previous distilled liquors. By 2010 The world’s five biggest alcohol companies by market cap had their hubs in Beligum Anheuser-Busch Inbev (BUD), Brazil (Companhia de Bebidas das Américas (AMBEV) (ABV); United Kingdom (Diageo plc (DEO), The Netherlands (Heineken (HINKY.PK) and France (Pernod-Ricard (PDRDF.PK). And the industry gives provides with jobs to millions of workers around the globe. Today, in 2011 we face a different but at the same time similar Prohibition of a product. I refer to the research, production, industrialization and commercialization of controlled drugs (marihuana, cocaine, etc.) that has been condemned by world government with the same irrational argument once used with alcohol. Because of this Prohibition on Drugs; the world is facing a Trillionaire war leaded by the United States politicians who profit from it. More so, millions of jobs are lost every day and in the countries in which it is produced and stored before reaching the final markets the chaos reigns (for just one story of how this chaos come into being check: The Drug War in Guatemala: A Conversation with Giancarlo Ibarguen). Let us learn from history and save our children and future generations from committing the same mistakes. Next Post Win an Audiobook of Ayn Rand this Xmas!! !